Nestled comfortably between the Pacific Ocean and a pair of stunning active volcanoes, Puna Hawaii has long held a position of great importance for both Hawaiian history and its economy. A rugged and beautiful place to visit, Puna offers a unique reprieve from the tourism-heavy regions found elsewhere in Hawaii. Locals like artists, organic farmers, and off-grid enthusiasts call the region home, attracted to the solitude and close-knit community that comes naturally with this rugged area. 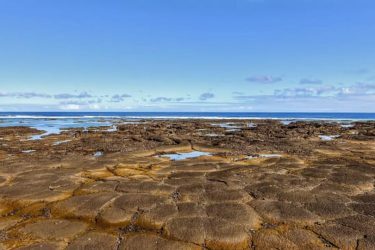 Mountain trails and great tracts of rainforest give way to lava fields and stunning beach parks for hikers, adventurers and outdoor enthusiasts to enjoy on the Big Island’s eastern side. Extensive hiking trails, lush and tropical rainforests, and expansive national and state lands offer unique and beautiful opportunities for visitors. The Kapoho-Kalapana Road, also known as the Red Road, is a 15 mile stretch of highway along the lower coastline of Puna. While winding and slow-going, the Red Road drive provides finger-brushing proximity to jungle vines, lava fields, and crashing waves. Fishermen, surfers, farmers and artists sparsely populate the surrounding area and it’s a great chance to glimpse a Hawaii removed from the modern rush. 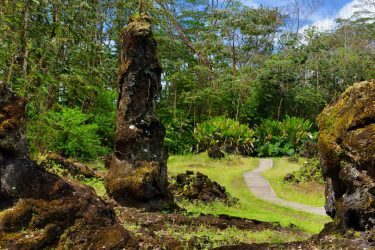 Visitors to Volcanoes National Park should pack tactfully; the rugged terrain and lack of accommodations means you’ll want safety gear, solid hiking shoes, and plenty of water. Cycling tours take visitors throughout key points in the park, but it’s also possible to rent a bike for some solo adventuring. Positioned along the eastern side of the Big Island, Puna is a region heavily impacted and influenced by the active volcanoes of Mauna Loa and Kilauea. 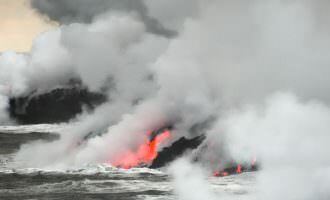 Residents enjoy lower housing costs compared to the rest of the island, but securing services and home insurance can be difficult due to the proximity to lava flow zones. Vegetation spans from tropical, dense rainforest to shrubs interspersed among lava rocks. Native forests in Kahauala and Wao Kele o Puna offer looks at rare plants and animals, with potential undocumented species throughout the region. The area receives an average rainfall on par with a mild tropical climate, with heavy storms occurring occasionally in the northern point of Puna. Along the coast are rugged black rock and sandy beaches, roiling oceans, and the occasional surf breaks. Puna’s major communities shift throughout the years due to volcanic activity, but towns like Pahoa, Volcano, Mountain View, and Hawaiian Acres continue to thrive on their own. You’ll find the occasional coffee stand, food shack, and bed and breakfast scattered through Puna, so if you’re planning a visit, it’s recommended you take the time to relax and explore. 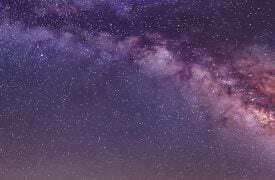 Visiting the tiny towns throughout the area will reward visitors with a chance to see how locals actually live. A far cry from the more tourism-heavy areas elsewhere on the Big Island, Puna keeps things simple. Artists, hippies, farmers, musicians, writers, and surfers make up a large portion of the population and their work can be seen throughout the area. Puna is often referred to as the volcano goddess Pele’s workshop. Her work can often be witnessed firsthand in Puna, where lava flows are so frequent and hazardous that entire communities have come and gone by her hand. As a result, Puna is considered a place of the utmost traditional importance, with protective and historic sites occupying much of the region. Visitors are encouraged to respect the local population and natural sites during their explorations. Not a great deal of subsurface archaeological excavations have occurred in Puna and historians put the first human settlements in the area between 300-600 A.D. Hawaiian legend says that Puna was a beautiful, prosperous district prior to 1600, in which Chief Keliikuku of Puna made a journey to Oahu and received a terrible prophecy from a local prophet. Upon his return, he beheld an uninhabitable land set aflame by Pele. Sugar plantations, macadamia nuts, and other agricultural developments provided the majority of income for early residents of Puna, but the New Deal brought jobs in the 1930s and ‘40s to improve parks, roads, and campsites. Aside from a major development push in the late ‘50s and early-mid 2000s, Puna has remained a natural, largely unnoticed reprieve from the major commercial and economic forces present elsewhere on the Big Island. Historically, Pele’s wrath has rendered both residential and commercial developments a difficult undertaking in parts of Puna. 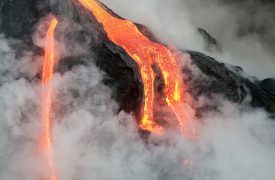 With high-risk Lava Flow Hazard Zones and most of the property destruction in last 100 years occurring in lower Puna, major sections of communities like Kapoho, Kalapana, Kaimu, and Royal Gardens sustained extensive damage. Despite the lack of typical attractions and large-scale accommodations in Puna, visitors enjoy relaxation, calm, and wondrous natural spectacles during their stay in this distinct and beautiful slice of Hawaii. An ancient Hawaiian deity, Pele is the Fire Goddess of Hawaii, ruler of fire, lightning, volcanoes, wind, and creator of all the Hawaiian Islands. 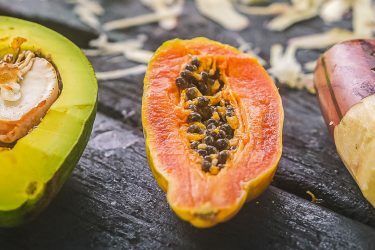 Wednesdays are the perfect evening to explore off the beaten path and experience a nice flavor of local life at the Ho’olaule’a Farmers Market. 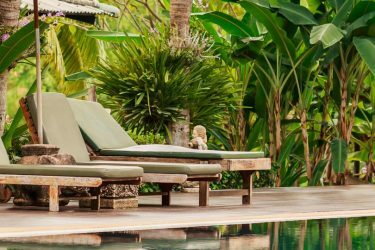 Puna is a vast and sleepy region with few large resorts or hotels, making it a perfect escape if you can locate a great Vacation Rental or B&B, so try one of these. If you’re visiting the Puna Area, here are the state and national parks you should see to gain a taste of Hawaii’s culture and unique natural wonders. 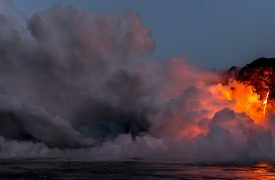 From the red glow of molten lava, to ocean entry plumes and exciting crater activity, watch the Big Island’s lava flow and volcanic activity of Kilauea. Enjoy one of the best sunset dinner shows on the Big Island, presenting the legends and lore of Polynesia, with oceanfront dining and dancing. Fly high on a parasail and enjoy an awe inspiring bird’s eye view hundreds of feet above the Big Island’s Kona Coast. 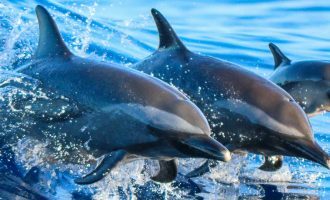 Explore the underwater world of the dolphin in this exciting dolphin video from Kona Hawaii. 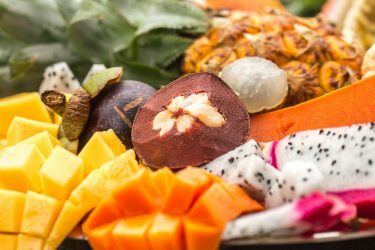 Puna is host to several large Farmers Markets offering up some of the island’s best produce, delicious cuisine and handmade crafts. 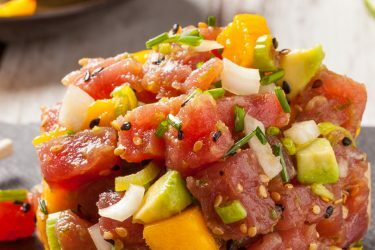 The Puna District has many locally-owned restaurants perfect for a quick, affordable bite on your way to your next Big Island activity. 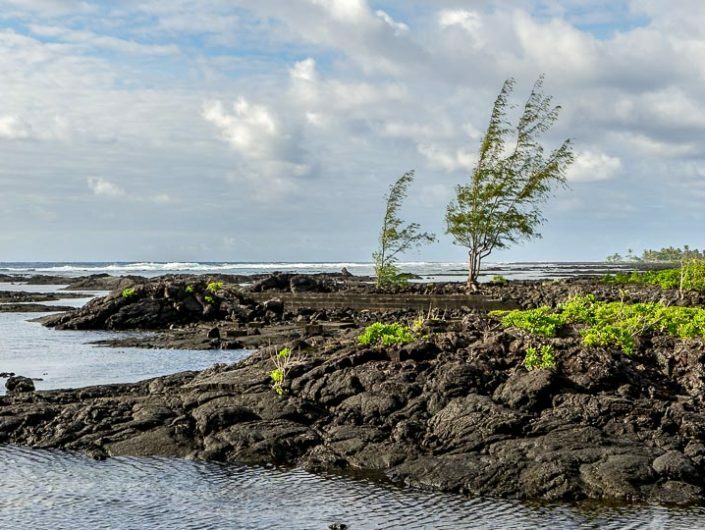 A unique and beautiful snorkeling experience near Hilo, these tide pools offer excellent water adventures for the whole family to enjoy. 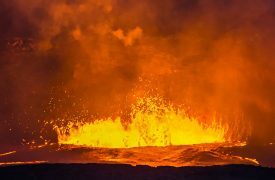 The original lava boat tour company on the Big Island, Lava Ocean Tours is the most experienced crew to ferry you to the active lava flows. An idyllic rural adventure on the Big Island’s southeastern side, horseback riding tours at Silver Crest Farms provides a hands-on, authentic Hawaiian adventure you won’t find elsewhere. 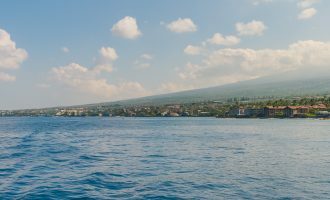 Hawaiian-owned and operated, this Lava Boat tour brings you to the incredible ocean entry of the lava flows for an impressive view. 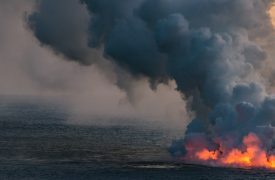 Specializing in a unique and comfortable lava viewing tour, Kalapana Lava Boat is family-friendly and accommodating of every budget. 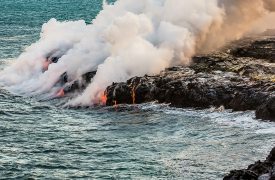 An oversized and affordable lava tour, Kalapana Cultural Tours offers everything you need to be comfortable and entertained on your adventure. An environmentally-focused tour company on Hawaii’s Big Island, Nui Pohaku Adventure Tours offers a locally-owned, community-focused tour experience you’ll never forget. 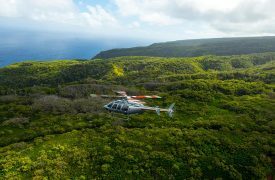 Spanning throughout the Big Island’s most notable natural attractions, Paradise Helicopters offers luxury aerial tour experiences the whole family can enjoy. 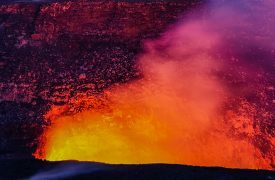 An incredible opportunity to experience the lava flows in Hawaii Volcanoes National Park up close and personal, Volcano Bike Tours offers affordability and reliability throughout your tour. 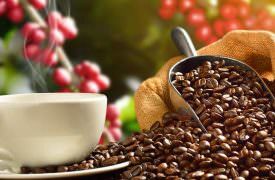 Along with serving up great coffee, food and drinks, Hilo Coffee Mill also offers fun and enjoyable visitor tours with tons of interesting and insightful coffee information. 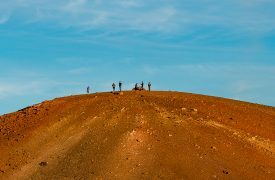 Offering a well-rounded tour experience that takes you to the top of the Big Island’s greatest geologic feature, Mauna Kea Summit Adventures makes reaching the summit easy. 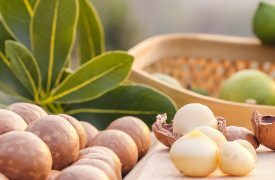 As one of the largest agricultural forces on the Big Island, the Mauna Loa Macadamia Nut Corporation offers extensive, tasty tours for guests to this remarkable island. A prominent tour provider along the Big Island’s eastern coast, Jack’s Tours offers an informative tour experience throughout their adventures.